Red light cameras - what are they good for? If you're thinking 'absolutely nothing,' then read up. Getting your photograph taken in public without your permission can be surprising. Though, when you're going through a red light, you shouldn't look so shocked. Photo red light cameras have been debated annually. Gov. John Hickenlooper has twice vetoed bills passed at the Coloardo state legislature to ban photo radar statewide. Aurora City Council is considering letting voters have the final say. "Councilmembers, for years now, have been talking about the program being controversial," said Aurora City Councilman Bob LeGare. LeGare has suggested ballot language that should appear on Aurora ballots in November. "Shall Aurora continue to issue photo red light tickets to drivers that enter an intersection after the traffic light turns red?" "I think it's important to preface that when I returned to city council in 2012, I was an adamant opponent of the red-light camera program," said LeGare. "After doing research and looking at the statistics in Aurora, the crash data and the severity of the accidents that were occurring, I became a staunch supporter of the program." At a presentation (pages 222-253 in the document if you'd like to read more) on Monday night, Aurora Police provided statistics on crashes at photo red light intersections. In 2017, there were 80 crashes caused by a driver going in the direction of photo red light enforcement, compared to 115 the year before. However, in 2013, there were 65 crashes. There are cameras at 14 spots in Aurora. Since 2013, violations are down at 11 of those locations. They have increased at eastbound Iliff Avenue at Chambers Road, eastbound Mississippi Avenue at Chambers Road and eastbound Alameda Ave at Peoria Street. The violations have nearly been cut in half in the last five years at eastbound Mississippi Avenue at Abilene Street. In 2017, there were 46,612 violations issued. In 2013, there were 61,285. Recently, Aurora added more than a second to the length of time a light stays yellow in the intersections where photo radar exists, according to Aurora Police Lt. Jad Lanigan. At the same time council is deciding whether or not to ask voters the future of photo red light cameras, they are also getting a presentation on what photo red light cameras might look like in the future. The current cameras are low resolution, according to Lanigan. They serve one purpose and that's to capture cars going through an intersection once the light has turned red. Sometimes, the cameras capture other crimes. Lanigan said the cameras at Iliff Avenue and Chambers Road helped with the prosecution of a vehicular homicide case because the suspect vehicle activated the cameras by running the red light. 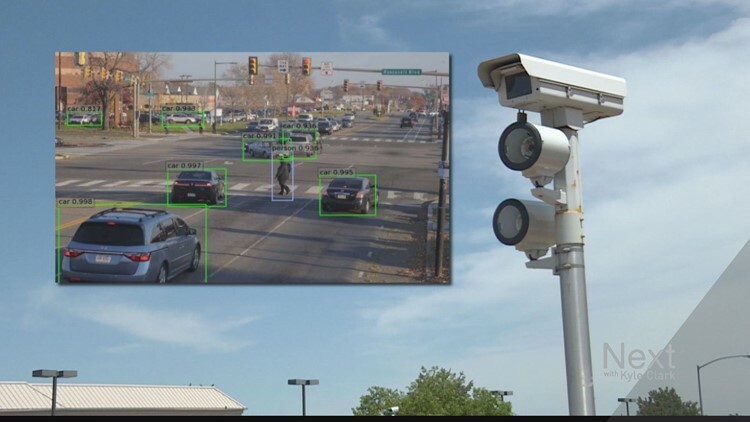 The cameras could be replaced with newer technology that allows the red-light cameras to pan and tilt, record vehicle and pedestrian counts, read license plates, identify gunshots through a ShotSpotter system, and stream 24/7. Next wanted to know if voters were going to be notified about that while being asked if they want to keep the red-light camera program. "The answer to that question is no because that is going to be totally unrelated to the question. For us to do all of those things with red light cameras would be a major policy change, and that would go through an extended public outreach process," said LeGare. "Once this is on the ballot, there'll be some opposition group pointing all of these things out." For this to end up on the ballot in November, the council needs to send the issue from tonight's study session to a regular city council meeting. If that happens, council will take public debate and vote on the issue just like anything else, and if it gets majority support, it would be on the ballot in November.